Animosity toward Russia’s ruling class had already been building for centuries when the House of Romanov took power. But a series of violent suppressions and a mounting death toll during World War I ultimately led to the fall of the last empire in Russia, the final Tsar Nicholas II, and his family. These haunting photos depict the lives of the Romanovs before their executions in 1918. The remains of the Romanov family members weren’t discovered until nearly six decades after their brutal slaying. Take a look at the shocking discovery, as well as intimate final photos of the family. 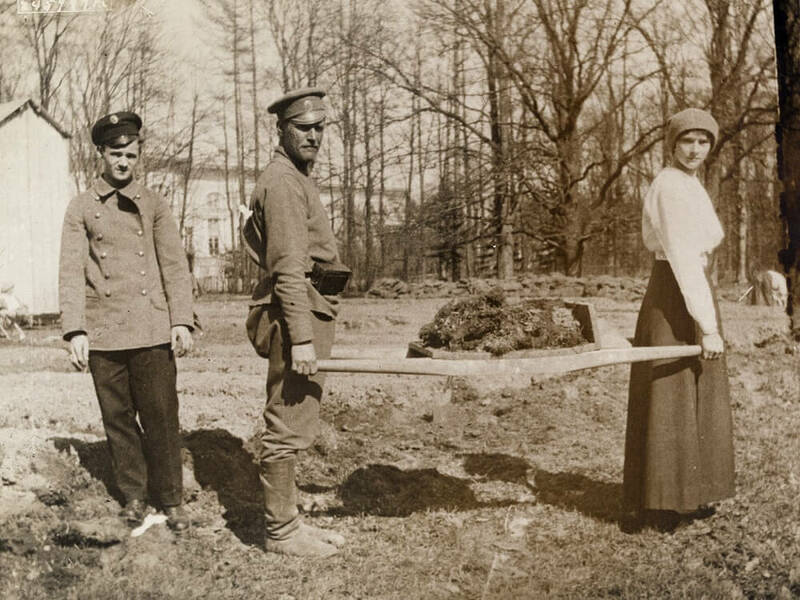 After the execution of the Romanov family, their bodies lay in two unmarked graves in locations which were kept secret by Soviet Leaders. It wasn’t until 1979 that amateur historians found the remains of family members, which were later reopened and confirmed via DNA testing. 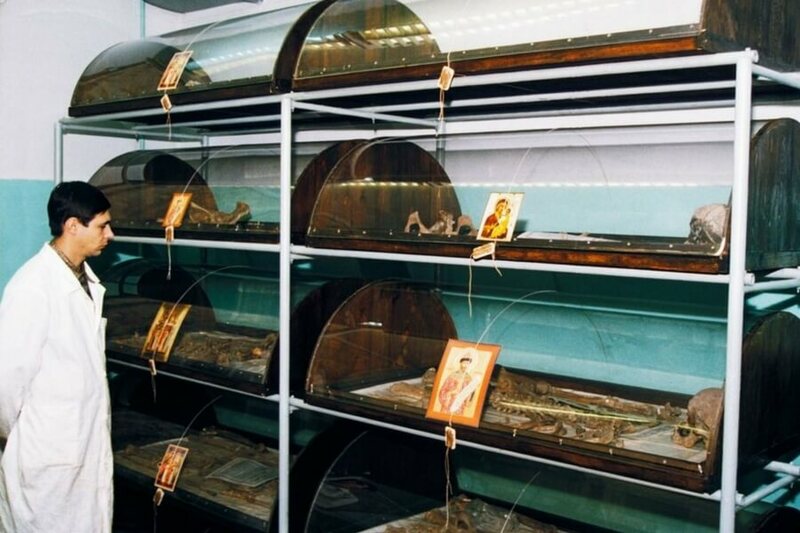 The Romanovs remains were removed and relocated to a room in the Bureau of Forensic Examination in Ekaterinburg. Although the amateur historians uncovered the bodies of Nicholas, Alexandra and daughters Olga, Tatiana, and Anastasia—Alexei and Maria’s remains were not located until 2007. Since then, there have been numerous investigations opened and reopened regarding the murders. This photograph of the Romanov family was found in six recovered family albums that are housed in the Beinecke Library at Yale University. Many of the photos in the recovered albums were shot by the Russian Imperial family’s head of household—Tsar Nicholas II himself. 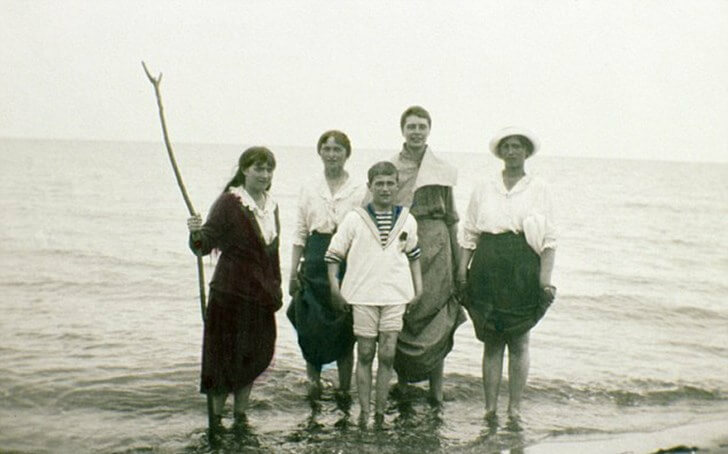 Pictured below, the last Tsar of Russia’s children pose for a photo while standing in shallow water during a day at the beach. The photo captures three of his daughters as well as their younger brother Alexei Nikolaevich, the heir apparent to the throne of the Russian Empire. He would’ve been about 13 years old at the time. This photo shows Tsar Nicholas II visiting a regiment of Kuban Cossacks in Russia along with his children during World War 1. The Tsar’s older daughters and wife helped nurse wounded soldiers as volunteers with the Red Cross during the war, though Anastasia was too young to help, so she played games of checkers and billiards with soldiers to lift their spirits instead. During the war, Nicholas II took command of the army on the front lines. The war also provided an opportunity for his wife, Alexandra, to influence him toward an authoritarian government approach. Her German origin injured the Romanov’s reputation during this time. 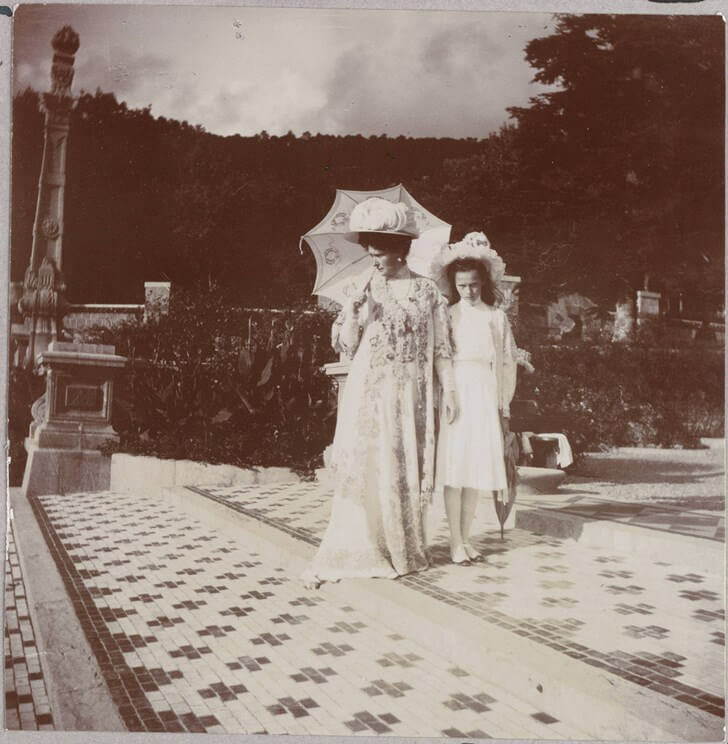 This photograph from the Beinecke Library’s collection shows Empress Alexandra walking with her second daughter, Grand Duchess Tatiana Nikolaevna. During her lifetime, Tatiana was the best known of the Romanov family’s daughters. She was said to be the daughter who most favored her mother, Alexandra, and was often said to be her mother’s favorite daughter. Tatiana became a skilled Red Cross nurse when the war broke out, along with Alexandra and her sister, Olga. They cared for wounded soldiers in a private hospital on the Tsarskoe Selo grounds before the Romanov family was arrested during the Russian Revolution of 1917. 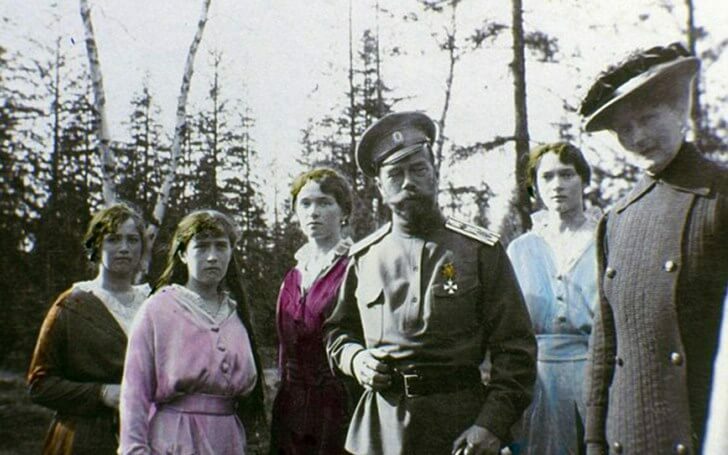 In the photograph from the Beinecke Library’s collection of recovered Romanov family albums, Tsar Nicholas II is pictured with his daughters, Maria, Anastasia, Olga, and Tatiana. All four daughters were born before the heir apparent, Alexei. Olga was closest to Tatiana. They were known as “The Big Pair.” They were always seen together. Maria and her younger sister Anastasia were known as “The Little Pair.” Like Olga and Tatiana, they shared a room and dressed alike. The four girls were raised as simply as possible, sleeping on hard cots when they weren’t ill, and taking cold baths in the morning. 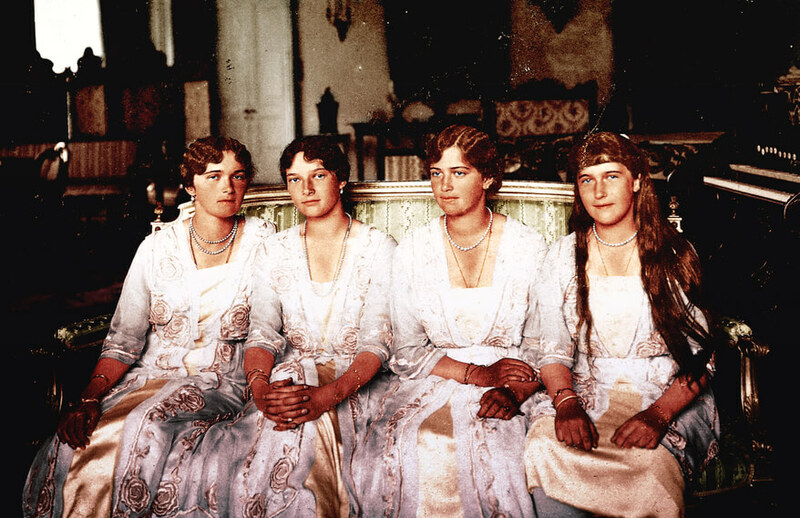 The Romanov daughters, Olga, Tatiana, Maria, and Anastasia, are pictured in a formal portrait taken in 1916, just two years before their execution. With pearls on their necks, they pose in evening gowns in one of the salons, which is decorated with French furniture. Behind them is an organ with sheet music, which all of Tsar Nicholas II’s daughters learned how to play. Tatiana was the best player of the four girls. The relaxed portrait shows no sign of the tragedy that would soon befall the Romanov girls. In just a year, they would be placed under house arrest and confined to their quarters. The Romanov daughters are pictured here looking very different from the formal piano portrait they took together just a year earlier. 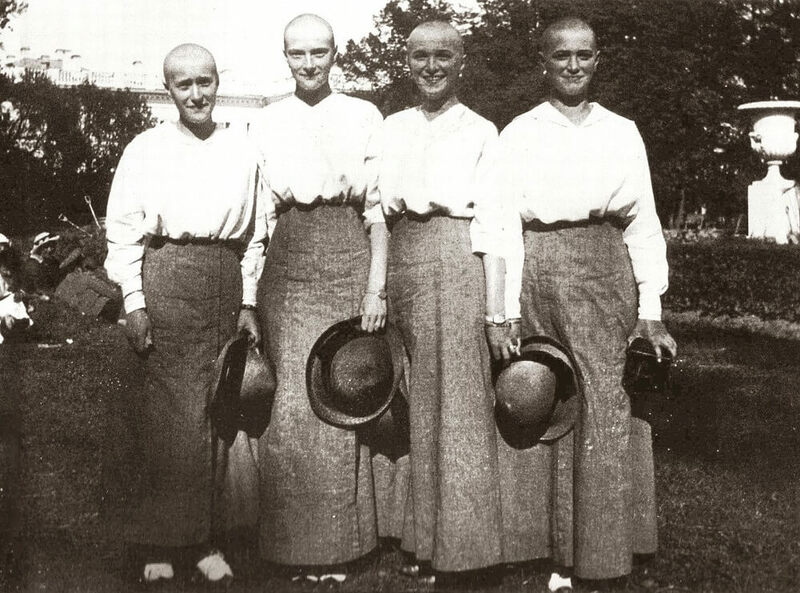 The grand duchesses shaved their heads in the spring of 1917 after a bout with measles. Captivity certainly took its toll on the Romanovs. When thinking about the gruesome end that befell the Romanov children, it’s strange to look at earlier photographs of them playing. 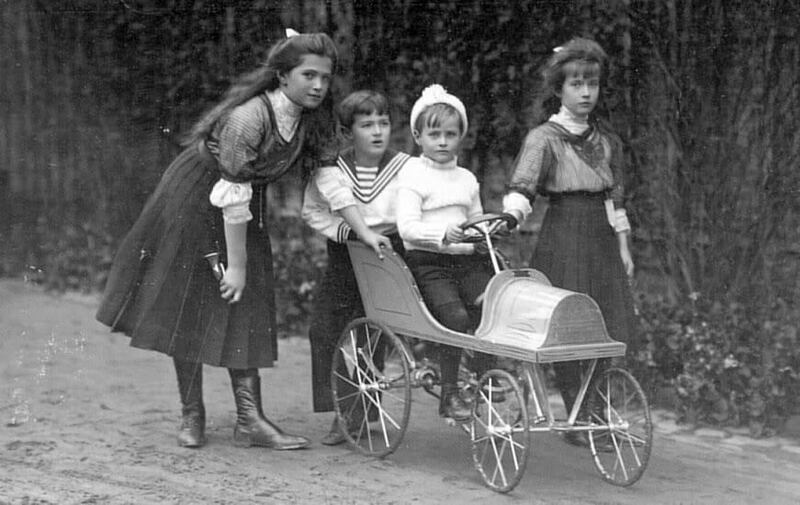 Grand Duchess Maria, Tsarevich Alexei, Georg Donatus, the Hereditary Grand Duke of Hesse, and Grand Duchess Anastasia are pictured here playing with a toy car at Schloss Wolfsgarten, a royal hunting lodge. The photograph was taken in the Autumn of 1910 when Anastasia was just nine years old, Alexei was six years old, and Maria was 11 years old. Tatiana and Olga were the only one of the Romanov children who would live to turn 20 years old. Olga lived to be the oldest, executed at age 22. 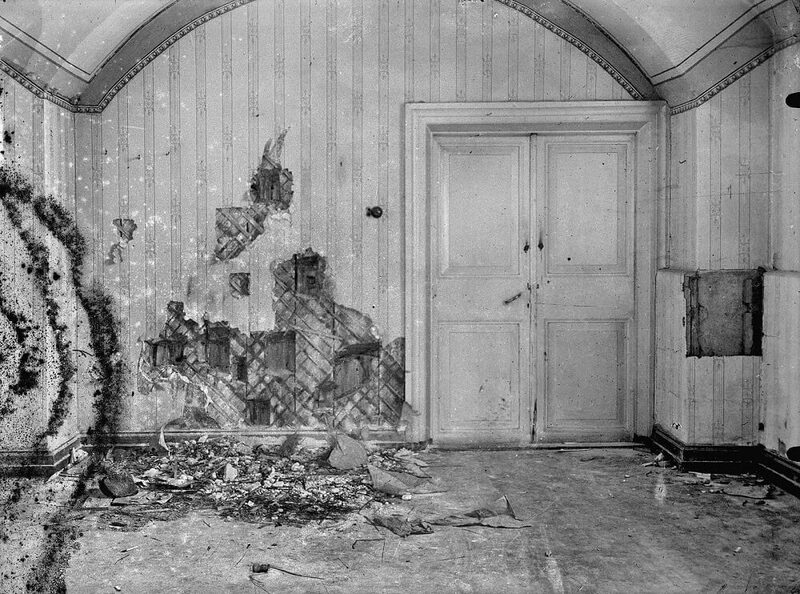 The photograph below offers a glimpse into the Romanov’s captivity at Tobolsk. 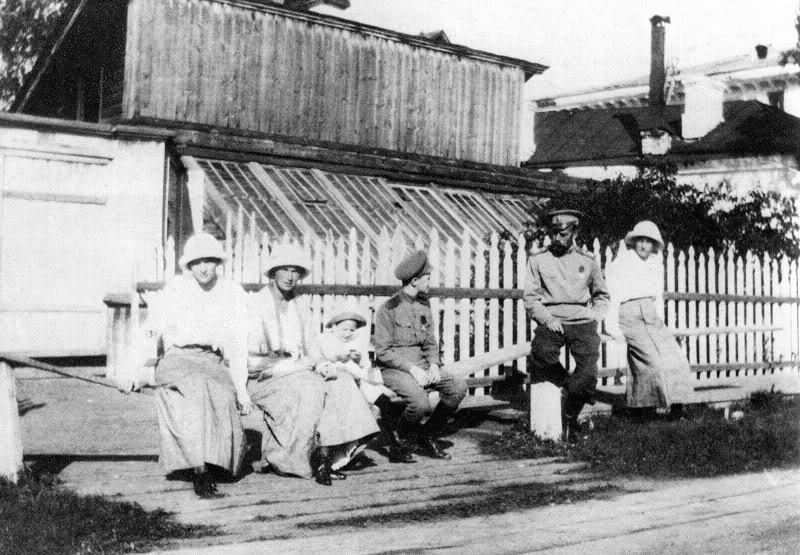 The former tsar, Nicholas II, sits with Tatiana, Olga, a little boy of a servant, Alexei, and Anastasia on a fence in front of a greenhouse. In August of 1917, the Romanovs were sent to Tobolsk by Alexander Kerensky’s provisional government, supposedly to protect them from the revolution. They lived in the former governor’s mansion in relative comfort until October 1917 when the Bolsheviks came to power. Then, the conditions of their imprisonment became stricter. The photograph above was taken in September 1917, just a month before life would become even more difficult for the Romanovs. The photograph here is believed the be the last photograph ever taken of Empress Alexandra Feodorovna. She sits under an umbrella on the balcony of the Governor’s Mansion at Tobolsk in Siberia. Her daughters Olga and Tatiana are by her side. The photo was taken in the spring of 1918. The Romanovs would be executed just a few months later by Bolshevik troops led by Yakov Yurovsky. Tsarina Alexandra was the granddaughter of Queen Victoria of the United Kingdom. Her faith in the mystic Grigori Rasputin, her influence on her husband, specifically to resist surrendering Siberiaratic authority over the country, and her German heritage severely damaged the reputation of the Romanovs. Prior to their fall from grace, the Emperor and his family enjoyed incredible wealth and luxury, including luxury forms of transportation. 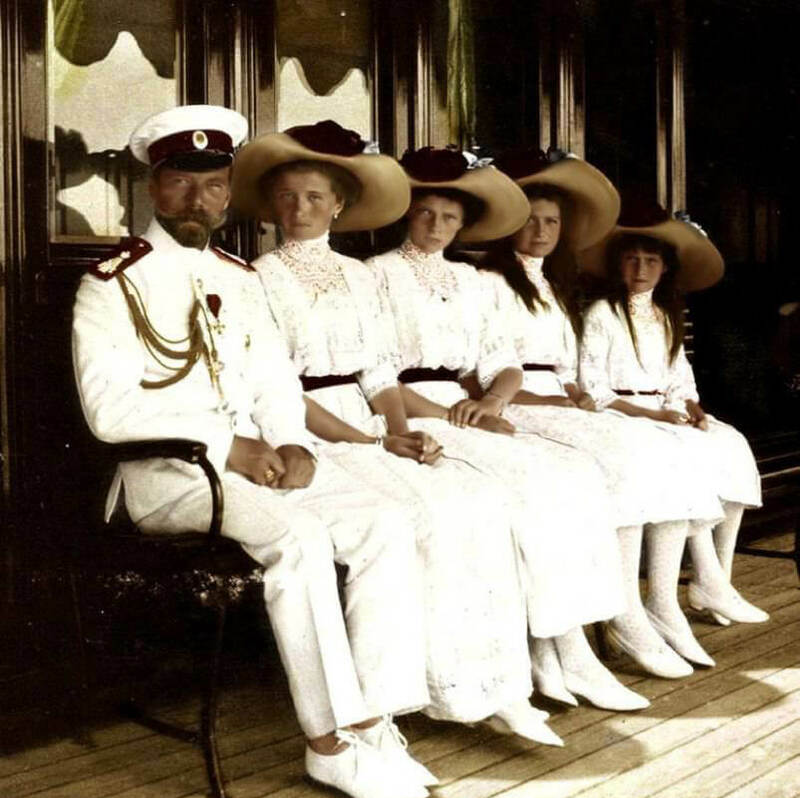 This photo show the Tsar sitting with his four daughters while vacationing on their imperial yacht, the Standart. The Standart was commissioned by Tsar Nicholas’s father, Emperor Alexander III. It was reportedly one of the most luxurious vessels of its time, fitted with crystal chandeliers and mahogany paneling, with the idea of making it a floating palace for the royal family. The yacht was also where the royal family were told in 1914 of the assassination of Archduke Ferdinand that would ultimately be the catalyst for the first World War. This haunting photograph of Grand Duchess Anastasia was taken shortly before her execution while she was being held in captivity at Tobolsk in the spring of 1918. 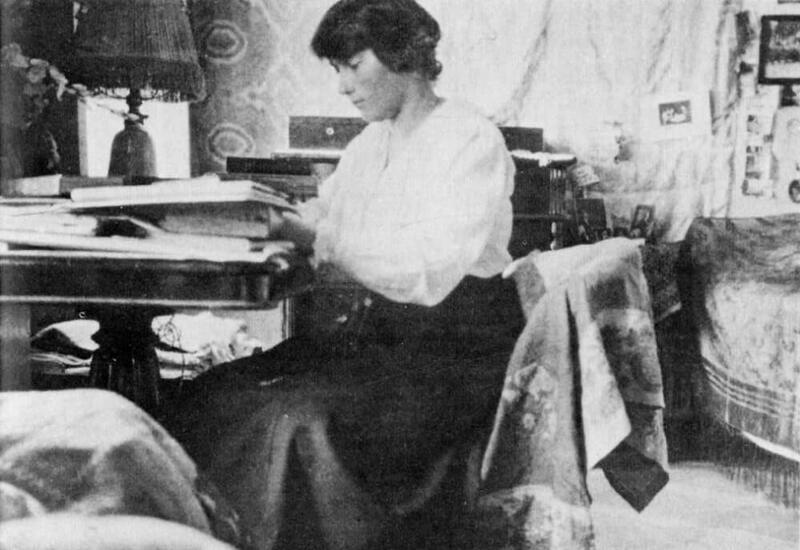 She is sitting at a desk in her bedroom during captivity. There were many false reports of Anastasia’s survival through the 20th century, inspiring books and films. At least ten women claimed to be the Grand Duchess. The best-known imposter was Anna Anderson. Anderson was cremated upon her death in 1984, but DNA testing showed no relation to the Romanov family. 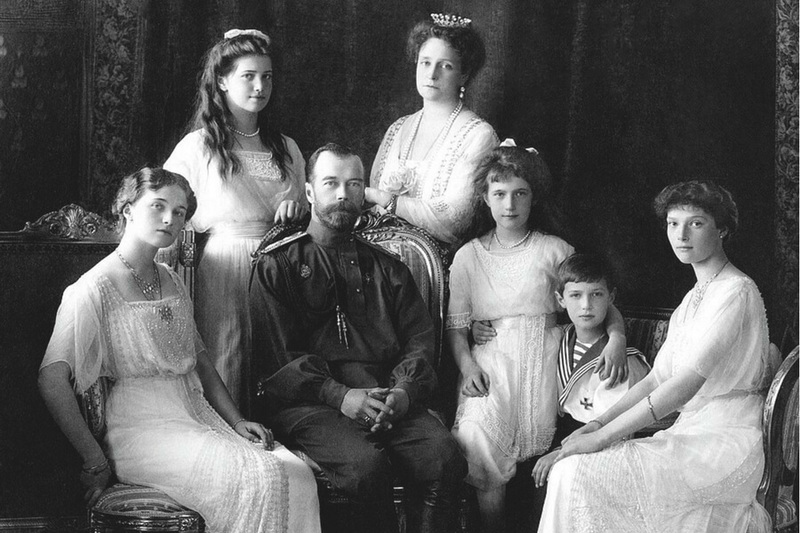 However, DNA testing at two grave sites has now identified the four Romanov daughters, their parents, and Alexei, which proved conclusively that the entire family died in 1918. The Romanov’s house arrest started at the Alexander Palace at Tsarskoe Selo. Nicholas II, no longer a monarch and addressed by sentries as Nicholas Romanov, was reunited with his family there while they were held by the Provisional Government and confined to their quarters. The photograph above shows Olga, Alexei, Anastasia, and Tatiana sitting on the ground while being held captive. Anastasia is holding Tatiana’s beloved French bulldog, Ortipo, on her lap. The photograph was taken on May 1917, a couple of months after the Romanov children were reunited with their father and Alexandra was reunited with her husband on March 22, 1917. This photograph of Tsarevich Alexei Nikolaevich and Tsar Nicholas II is from the Beinecke Library’s collection of Romanov family photographs and was likely taken by Grand Duchess Maria Nikolaevena. The photograph was taken sometime in the winter of 1917-1918, while the Romanov family was being held captive at Tobolsk. At this time, the family’s conditions were far less comfortable than their initial house arrest, as the Bolsheviks had come to power in October 1917. 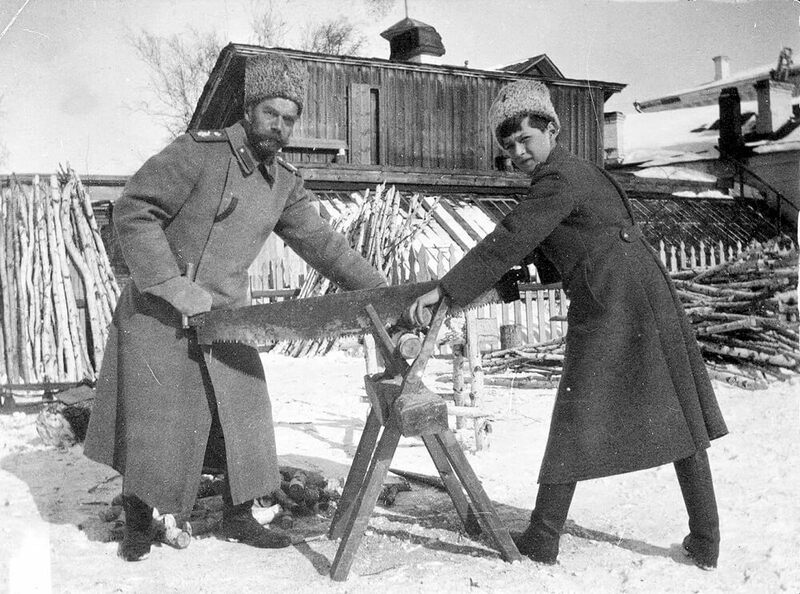 Alexei and his father are seen sawing wood since they were no longer permitted to have their ten devoted servants by their side. The family was also placed on soldier’s rations during this time. This photograph, taken in the spring of 1917 during the Romanov’s captivity, shows Alexei, Tatiana, and her French bulldog Ortipo sitting on the grounds of Tsarskoe Selo. Ortipo was given to Tatiana while she worked as a nurse during the war by her favorite infirmary patient, Dmitri Malama. The dog was a favorite of the family and was mentioned frequently in diaries and letters. Ultimately, Ortipo would travel with Grand Duchess Tatiana and the Romanov family as far as Tobolsk, where it was recorded that Tatiana tried to balance the dog and her suitcase in her arms while the family walked in the mud from the train station to their quarters at Tobolsk. This photograph from the Beinecke Library is also part of the Romanov family’s personal collection. 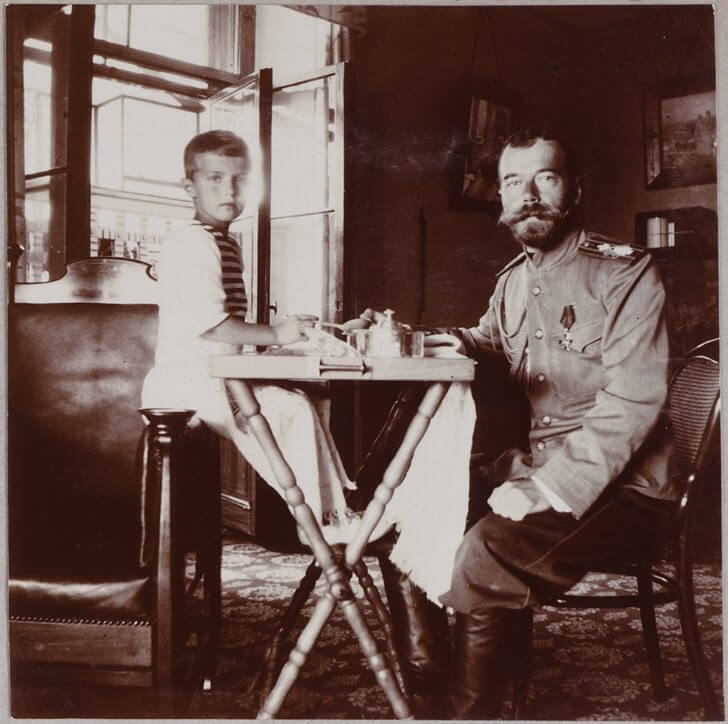 The photo captures a very young Prince Alexei sitting at the table with his father, Tsar Nicholas II. This candid moment reveals none of the political turmoil that was brewing beneath the surface. Prince Alexei was the only male child of Tsar Nicholas II and his wife Tsarina Alexandra, who also had four daughters. As the heir apparent, Alexei was doted on by his parents and sisters and was affectionately referred to as Alyosha. Alexei’s health was always a concern; he inherited hemophilia from his mother, which made trivial injuries like a bruise potentially life-threatening. This photograph from the United States Library of Congress was taken in the spring of 1917. 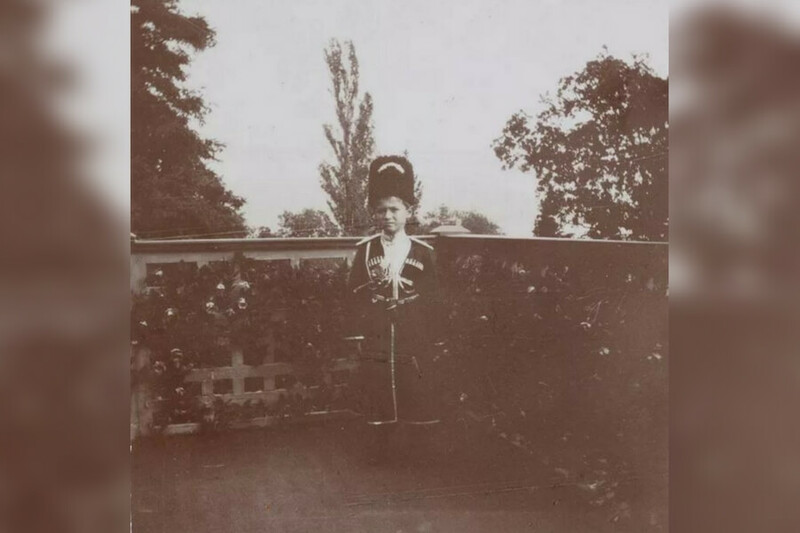 The photo shows Grand Duchess Tatiana during her captivity at Tsarskoe Selo. She transports lumps of sod on a stretcher with the aid of a soldier. It often fell upon Tatiana to hold her family together during captivity. She urged her mother to follow her father to Tobolsk when Alexei was too ill to be transported and helped her sisters and brother sew jewels into their clothing so they could go undetected by guards and would have funding to start a new life if they were able to escape. Tsar Nicholas II is shown here in a field surrounded by soldiers after his forced abdication on March 15, 1917. He was the last Emperor of Russia, and his reign saw the fall of the Russian Empire from a great power of the world to economic and military collapse. Nicholas II earned the name Nicholas the Bloody for the events of the Khodynka Tragedy, Bloody Sunday, the violent suppression of the 1905 Revolution, his perceived responsibility for and defeat in the Japanese War, and the anti-Semitic pogroms common under his empire. The estimated 3.3 million Russians killed in World War I and the lack of food and supplies on the home front were ultimately the downfalls of the Romanov dynasty. This photograph was taken at Tsarskoe Selo in 1916, about a year before the family would be held in captivity on the same grounds. 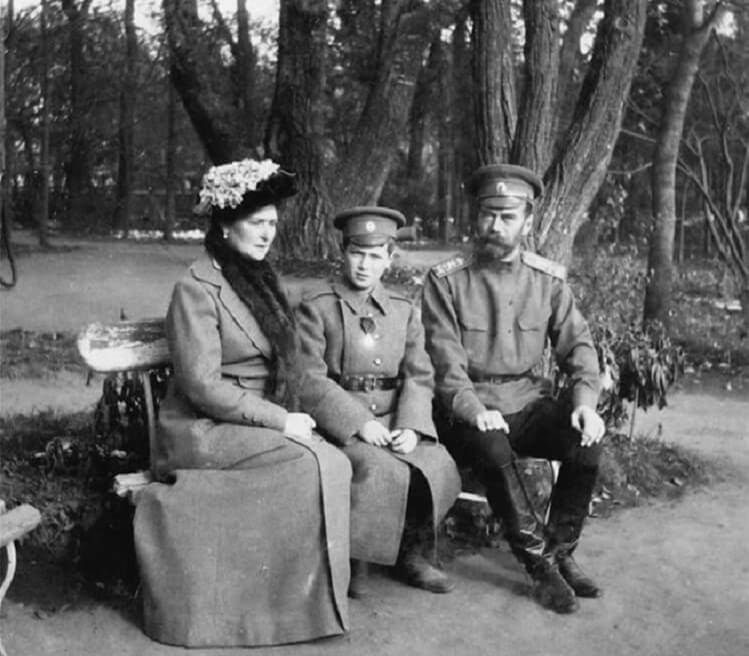 Alexei sits between his mother Empress Alexandra, and father Tsar Nicholas II. Before Tsarskoe Selo was a prison for the Romanovs, the beautiful Alexander Palace and adjacent Alexander Park were a summer residence for the family. Visiting nobility would also stay in Tsarskoe Selo, which is located about 15 miles south of the center of Saint Petersburg. After Bloody Sunday, Alexandra decided to make Alexander Palace the family’s permanent residence, since the Winter Palace was too dangerous. This photograph of Anastasia was taken in 1915 or 1916 before the Romanovs were taken captive. While it may initially look jarring, it simply depicts Anastasia fooling around with a pair of false teeth. Of course, back then false teeth were often made with teeth from the dead. So, with that knowledge, the photo is still a little creepy. Anastasia was known to be vivacious, mischievous, and energetic. She often played pranks on her tutors. Despite her high energy, Anastasia was often in poor health. She bled more than normal when injured, and may have been a carrier of the hemophilia gene like her mother. Before their execution, the Romanovs were moved to Yekaterinburg’s Ipatiev House. Around midnight on July 17, 1918, Yakov Yurovsky ordered the family to move to the basement under the pretense that it would be a safe location due to the impending chaos in Yekaterinburg. The family was taken to the cellar room and asked to wait there. They were only given a few seconds to process their orders for execution before they were shot chaotically. At one point, the guards opened the doors to let out the smoke. The Romanov children had jewels sewn into their clothing, which protected them from the initial shots. 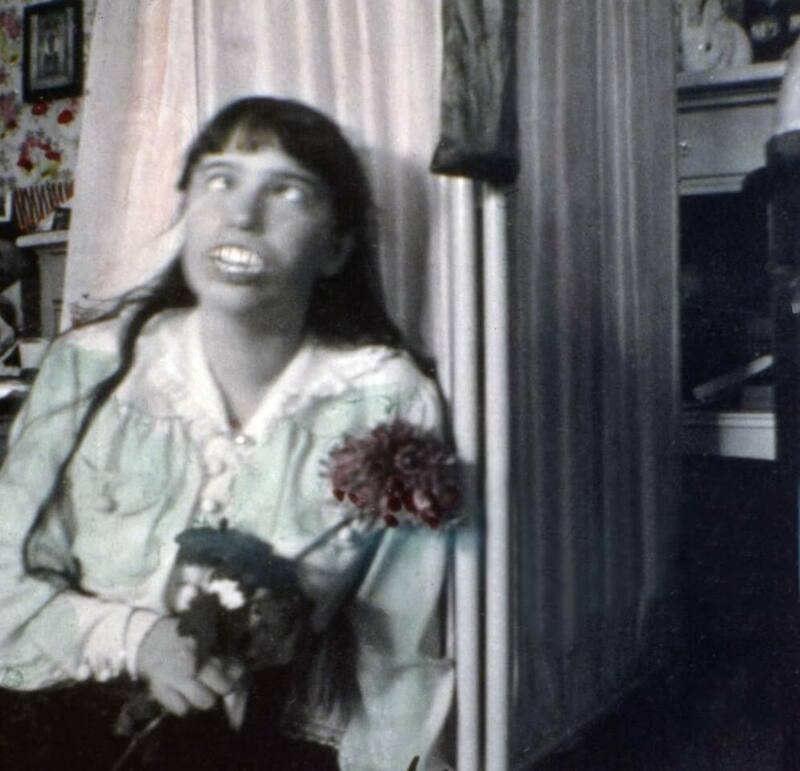 This photograph shows another angle of Anastasia Romanov playing around with some kind of false teeth and making a funny expression. Anastasia went on to become the most talked about of all of the Russian royal family after their murders. Partially because of rumors spread that Anastasia had survived the execution, which as previously mentioned turned out to be false. A popular animated children’s film was even made about what her life would have been life had she actually survived. Anastasia was not merely a fictional character or subject or lore but rather, as this photo indicates, she was just a normal young girl. In this photograph, some of the Romanov sisters are seen posing for the camera. Tsar Nicholas II, his wife Tsarina Alexandra and their five children Olga, Tatiana, Maria, Anastasia, and Alexei. Although, it is commonly known that Anastasia was the subject of myth for many years, so was her eldest sister Olga. Although over the years many began to claim they were members of the Russian royal family, one woman named Marga Boodts also staked her claim to royalty and said she was actually the Grand Duchess Olga. Some relatives of the royal family actually believed her to be Olga and Nikolaus the Hereditary Grand Duke of Oldenburg who was a godson of Tsar Nicholas II allegedly financially supported Marga until his death in 1970. 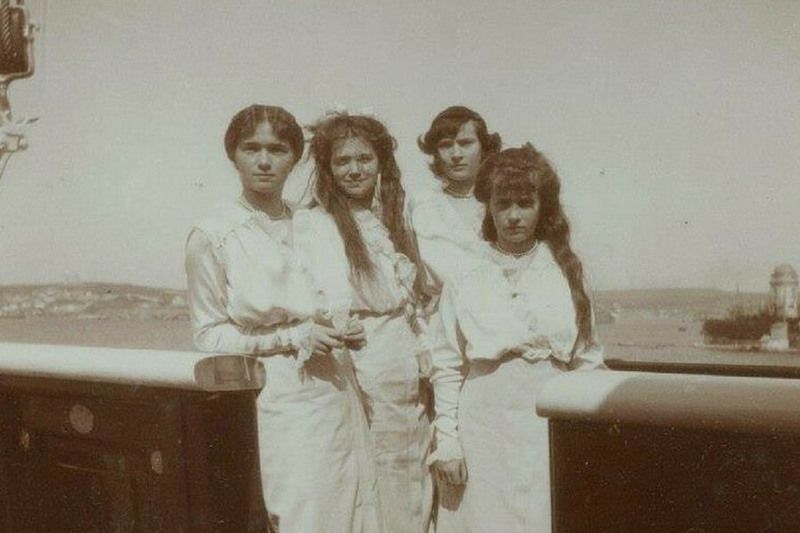 Tatiana, the second eldest Romanov sister is seen here during one of her family’s summer cruises. Tatiana was widely regarded to be “the most beautiful” of all the Romanov sisters. Her hair was said to be dark auburn and she had blue-grey eyes. It was also said that of all the sisters she most closely resembled their mother. As the rest of the family, Tatiana had a relationship with the “healer” Grigori Rasputin. Rasputin met Tatiana when she was a young girl of around 12 years old but apparently, there was some controversy because he met her and her sisters while they were wearing their nightgowns. The Romanov family revered Rasputin and viewed him and everything he did as “holy”. 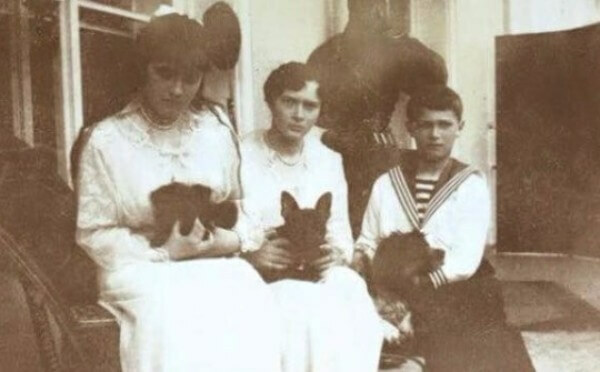 However, the Tsar’s sister Grand Duchess Xenia Alexandrovna was horrified after she was told by one of the girls’ caretakers who said that Rasputin had visited the two eldest sisters while they were getting ready for bed and was “caressing” them. Xenia apparently viewed Romanov as khlyst which was an offshoot of the Russian Orthodox Church and she regarded him with much suspicion. Ultimately, the caretaker he who viewed Rasputin with suspicion was fired. There were rumors that Rasputin had seduced the four sisters. Ultimately, Rasputin was murdered not long before the royal family themselves were executed. The Tsarina was widely unliked by her subjects and apparently came across as quite cold. However, Alexandra was apparently not trying to be rude but was rather shy. She was also known to be highly standoffish and only associated herself with a few close friends, which made other aristocrats view her with suspicion. The third sister Romanov sister, Grand Duchess Maria, was said to have survived the initial attack on the royal family. Along with her sister Anastasia, after the initial shooting, they were being carried outside to a truck and they “sat up screaming”. Some rumors surrounded the possible survival of Maria from the execution. Like her other sisters, people have claimed to be various family members and descendants of Maria’s. However, historians mostly discount the possibility that any of the family survived the attack. In one such story, two young women claimed to be Maria and Anastasia and were taken in by a priest in the Ural Mountains. They were subsequently buried with the names Anastasia and Maria Nikolaevna; however, no proof surrounding the claims has been found. This photograph shows Olga Romanov lying in bed. Eldest sister Olga’s marriage was often the source of rumor in Russian society. Allegedly, at one point Olga became engaged to Grand Duke Dmitri Pavlovich of Russia, her first cousin once removed. One author named Edvard Radzinsky asserts that the engagement was later broken off because Dmitri strongly disliked Grigori Rasputin. In The Rasputin File, Edvard also says that Dmitri was also rumored to be bi-sexual. Whether the rumors are true or not the betrothal never came to be. Olga was also rumored to be discussing marriage to Prince Carol of Romania, England’s George V, and Crown Prince Alexander of Serbia. At some point, Olga fell in love with Pavel Voronov, an officer; however, their relationship could not be because of their differing social status. This photograph shows Olga and Anastasia sitting alongside their mother sometime in 1916. All of the children enjoyed a close relationship with both of their parents. Olga often read books and then recommended them to her mother if they were suitable for her to read. Anastasia was known for being silly and goofy, often teasing and making other family members laugh. When they were little, Alexandra always dressed her daughters in pairs and would have them wear identical clothing. When Alexei was born, he became the apple of the entire family’s eye. Alexandra was particularly obsessed with her son especially since she gave him the gene of hemophilia and felt it her duty to protect him. The peaceful photograph of the family enjoying Alexander Park is in stark contrast to this photo taken just a year later. 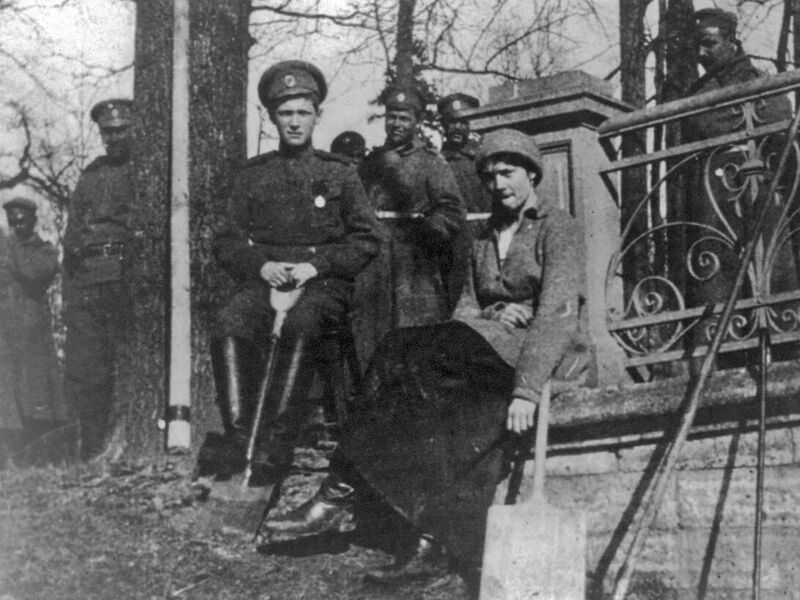 The photograph shows Grand Duchess Tatiana and Alexei sitting in Alexander Park in Tsarskoe Selo, holding shovels. They are surrounded by Russian soldiers and are under house arrest. Alexei’s hemophilia likely made any manual labor difficult and may have led to his severe illness in his last year of captivity, which initially prevented him from being transported. Tatiana, on the other hand, was used to physical work from her time as a Red Cross nurse during World War I. This photograph of Alexandra was taken a few years before the end of her life. It was Alexandra who brought Rasputin into the family circle, mainly because of her obsession with healing her son. She felt like Rasputin might hold the key to healing hemophilia. Towards the end of her life, Alexandra and the rest of her family were confined, she spent her time in a wheelchair. Either she was suffering from poor health or simply or emotional health was being worn down by the confinement. She, along with her husband the Tsar, were said to have been among the first to have been killed during the execution. 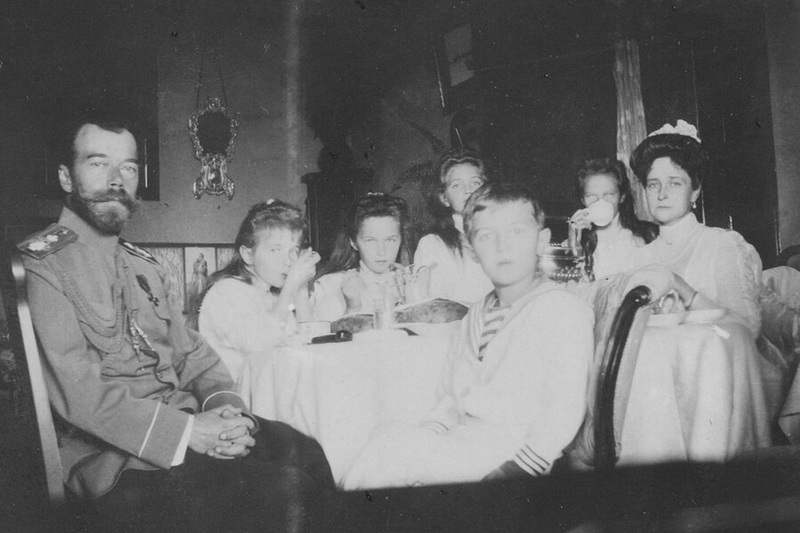 This photograph shows the youngest son Alexei playing war with the children of his tutor. World War I had broken out in 1914. Alexei was the youngest son of the Tsar and Tsarina, yet he was also the heir to the royal throne. In the Russian monarchy, only sons are able to be heirs to the crown. He is, of course, most famous for having hemophilia. His condition led to him being particularly spoiled and sometimes his behavior was looked down upon. He was also said to tempt fate as he got older which led to him getting severely injured a number of times. This photograph shows Prince Alexei with the royal elephant near the palace in Tsarskoye Selo. The photograph was taken in 1914, and in Tsar Nicholas’ journal, he wrote: “Took the elephant to our pond with Alexei today and had fun watching him bathe.” The elephant was apparently at the zoo on the family’s royal estate; however, after the 1917 Russian revolution, the zoo was closed. It is unknown what exactly became of the elephant or the other animals for that matter. It is quite interesting to see the juxtaposition of such a happy photograph of a family that was able to have their own personal zoo with the fate that awaited them. This photograph shows Olga, Alexei, and Tatiana. It was taken four years before they were executed in 1914. Alexei was known to be taken care of by his sisters especially the eldest Olga. Although at times she said it was difficult for her to control him. He allegedly loved playing pranks, especially as a young boy. One such story said that at a formal dinner he crawled underneath the table and removed the shoe of a female guest. When he showed it to his father, his father told the boy to return the shoe immediately. Alexei did but not before placing a strawberry on top. Alexei’s playful nature is shown in this photograph where he is seen playing with his father at the river. In spite of his illness, and undoubtedly to his mother’s chagrin, Alexei played in a rather rough manner. 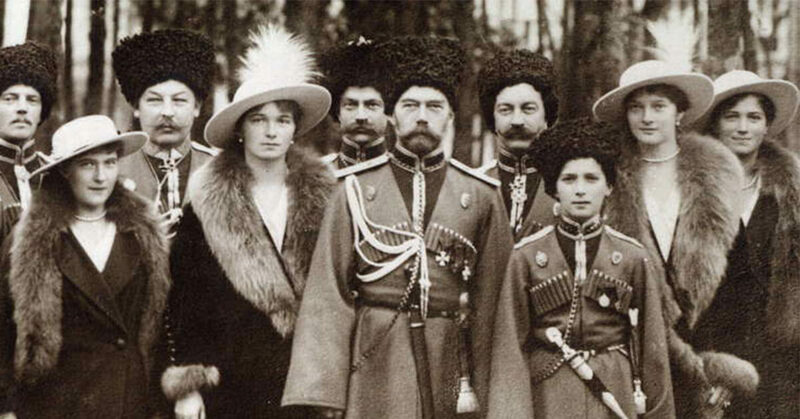 Towards the end of the lives of the royal family, they had been sent to Siberia. There, Alexei had a particularly bad accident while engaging in rough behavior. He decided to ride a sled indoors, down the stairs and horribly injured himself in the groin area. The hemorrhage was so bad that for the remaining weeks of his life he had to move around in a wheelchair. This photograph shows Alexei posing with his dog named Joy. It was taken in 1916 only two years before his death. Many people thought that Joy was also executed by the Bolsheviks in 1918. However, the Siberian Times wrote that Joy actually escaped death. Apparently, one of the executioners felt bad for the dog and saved him from death. The dog was allegedly later taken to Windsor, presumably to be with the English royal family. The survival of Joy was miraculous as two other of the family’s dogs were shot along with the family. Later, a grave belonging to Joy was discovered in England on the Sefton Lawn in Windsor. This photograph shows Tsar Nicholas and son Alexei out at sea in Finland. This photograph is quite striking as it’s a relatively solitary image. 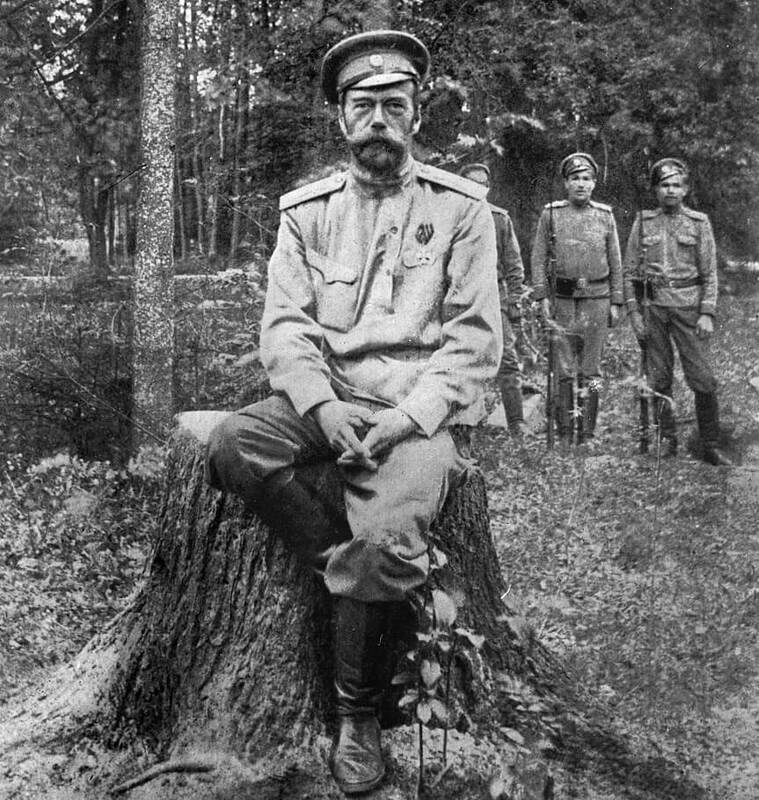 Despite his illness, the Tsar was known to engage Alexei in a variety of activities as he was the heir apparent and set to become the future Tsar. He allegedly also had Alexei sit it on long meetings so that he got used to the various duties and responsibilities it meant to be a royal. Of course, although he was the youngest child, he was the heir solely because he was the only male child. In the world of Russian royalty, only men were seen as fit to rule. This photograph was taken sometime during the first World War. 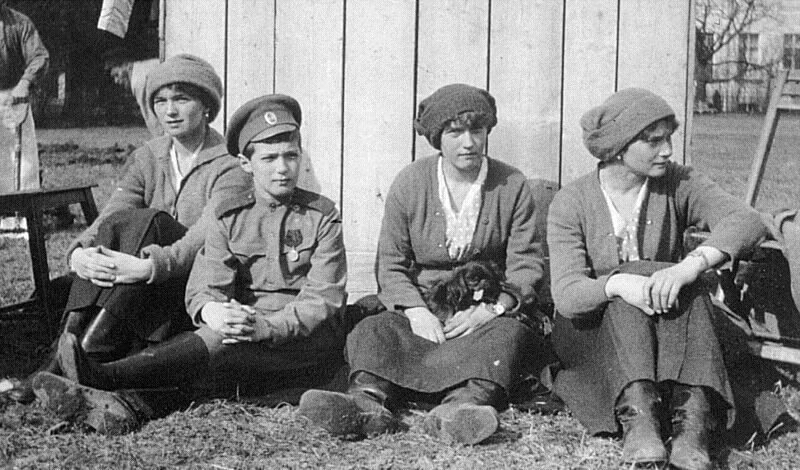 Often, the Romanov sisters would visit the soldiers, probably as an attempt to boost morale. During the war, the sisters even worked as nurses. One of the nurses that worked alongside Olga was named Valentina Chebotareva. In Valentina’s diary, she claimed that the love of Olga’s life was a wounded soldier she cared for named Dmitri Shakh-Bagov. Olga would allegedly be extremely excited when she would speak to him on the telephone or receive a letter from the hospital. Dmitri also allegedly adored Olga. He even apparently claimed to be willing to kill Rasputin for her if she wished. This photograph shows the Romanov sisters when they were working as nurses during the World War. More specifically, it shows the two eldest, Tatiana and Olga. Olga cared for and pitied the soldiers she helped to treat. The First World War, as most wars are, was quite brutal and horrific in nature. There is no doubt that the sisters would have been witness to some horrific sights. Apparently, the stress did eventually get to Olga and she acted out in a number of ways. It is quite interesting that a royal family would not choose to protect their daughters from the atrocities of war but rather have them serve in the midst of it all. Ultimately caring for the dying and catastrophically injured ultimately wore on Olga. She apparently had several moments of acting out her stress which included breaking a window and having various rages. She was ultimately moved to an office position instead of directly caring for patients due to her nerves. She was even given arsenic injections in 1915, which were at the time not thought of as a poison but rather as a treatment for depression and anxiety. Olga was also apparently very aware of the goings on politically and the way her family was received by the Russian people. This caused her to be in a constant state of worry about what might happen to her family. The royal family was ultimately sent by the Kerensky government (those who had taken power) to Tobolsk, Siberia. Some members of the royal family were instead sent to Crimea. However, the entire immediate royal family was sent to Siberia. Kerensky claimed it to be for the safety of the family, however, others suspected other motivations. All of the other members who reached Crimea survived the revolution. It was rumored that Siberia was chosen because that was the commonplace of exile. It was said that because the Tsar and his ancestors had banished many to Siberia that they deserved such a fate as well. This photograph was taken in 1918, which is the same year the Romanov family was executed. It shows Alexei and his mother Alexandra. The Kerensky government ultimately fell to the Bolsheviks who treated the Royals with even more disdain. In April of that year, the family was moved to Ekaterinburg, which would be their last place before they were executed. 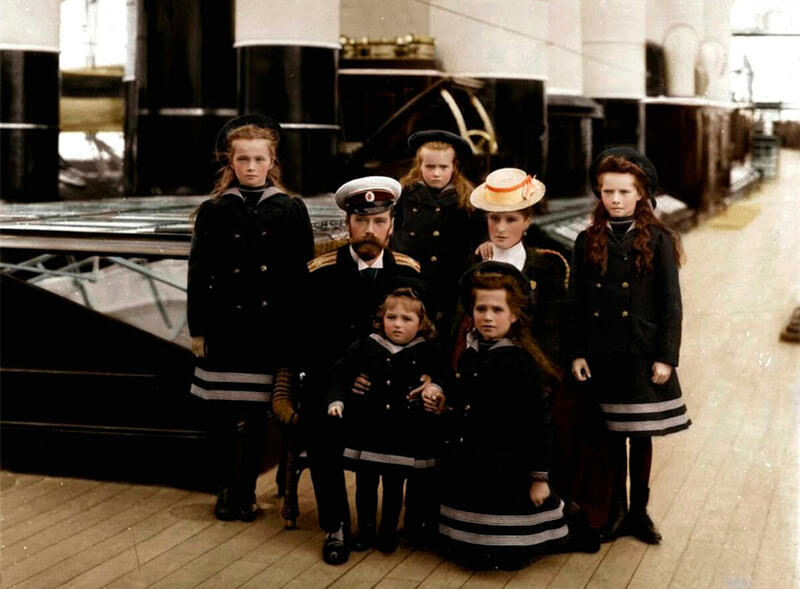 The family, forced into exile, lived completed isolated before their deaths which apparently wore quite heavily on most of the family, with the exception of the Tsar who was said to possess an “internal calm”. The family was also cut off from the outside world and had little news of what was happening so it is unlikely they saw what was coming. Here, Nicholas II of Russia and his wife Alexandra are photographed with their children including daughters Olga, Maria, Anastasia, and Tatiana, and son, Alexei. This portrait was shot by the Levitsky Studio and was one of the final portraits of the family altogether. Taken in 1913, this photograph was taken when the House of Romanov was still in reign. Less than two years later, on March 15, 1917, Tsar Nichols II would be abdicated as a result of the Revolution in favor of his brother Grand Duke Michael Alexandrovich. However, he declined to accept imperial authority and ultimately terminated the Romanov dynasty’s rule over Russia. Tsar Nicholas II is known for his poor handling of Bloody Sunday and Russia’s role in World War I. When demonstrators appealed to Nicholas II to improve working conditions in St. Petersburg, troops opened fire on the demonstrators, killing more than 1,000. His actions regarding these events ultimately led to his abdication and the execution of him and his entire family. 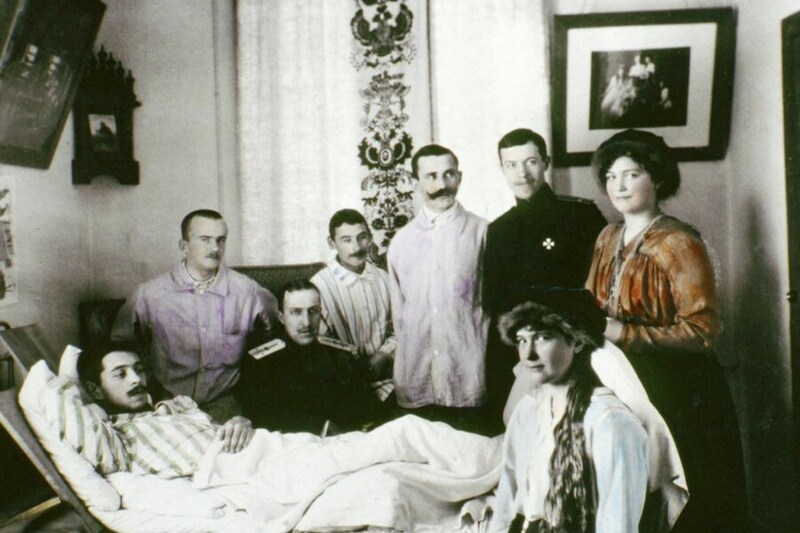 Prior to his abdication, many of the Romanov family members would visit wounded soldiers in the hospital. 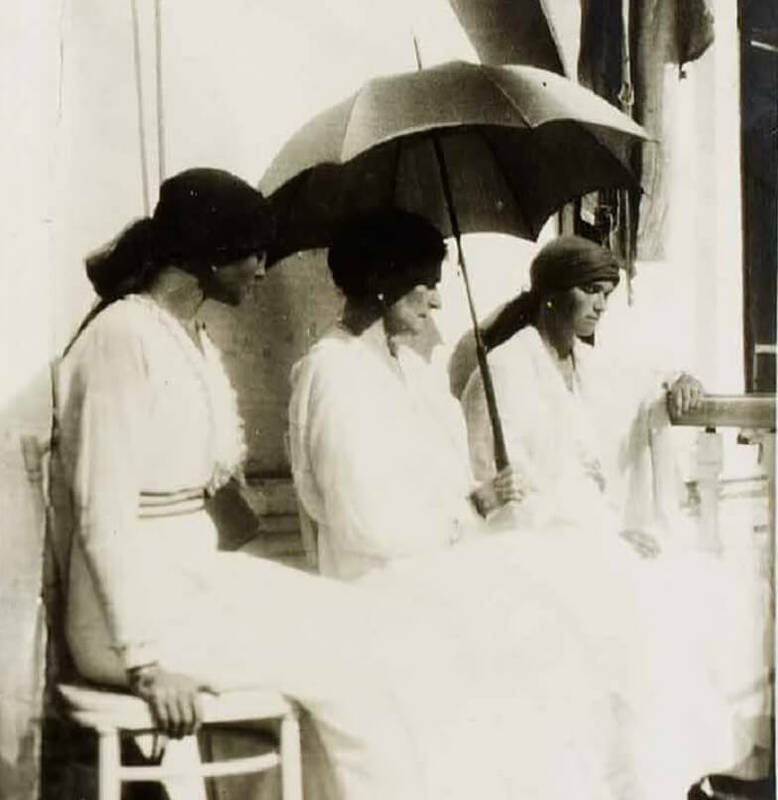 This picture shows Tsar Nichols II daughters Maria and Anatasia during one of their visits. This was of Tsar Nicholas II was taken in 1915 by none other than Tsar Nicholas II himself. Nicholas II was an amateur photographer who loved to take photographs of his family and day-to-day activities. He was meticulous when it came to his hobby and would take the utmost care of his pictures, filing them in various albums. Nichols II passed down his love for shooting film to his third-born daughter Maria. Maria was constantly photographing life through her eyes and took an interest in coloring many of the family photos. After the Romanovs were arrested and sent into exile, they brought a cook with them. This wasn’t intended to be a snobbish gesture—the family simply wanted to uphold the tradition and importance of eating family meals together. Amidst the chaos and uncertainty of being exiled, the family found comfort in the routine of making up daily menus as it reminded them of their happy life prior to the Russian revolution. Despite the harsh conditions under which they were living in while exiled, no one in the Romanov family ever complained about the limited food they were allowed in captivity. The Romanov family spent the remaining year of their lives in exile. Since they could no longer partake in many of their favorite activities, a large part of their lives centered around cooking. The Romanov sisters in particular eagerly spent their time learning how to cook and bake. The four sisters enjoyed baking bread the most. Born on August 12, 1904, Alexei Nikolaevich was the long-awaited son of the Romanovs. He was the youngest child and only son of the Emperor and Empress and was the heir apparent to the throne of the Russian Empire. Alexei was born with hemophilia, which caused bruising and blood-clotting issues. Because of his condition, Alexei had to be carefully monitored to prevent potentially life-threating injuries. As a result, he was doted on by his entire family, many of whom called him “Baby.” Alexei spent the last weeks of his life in a wheelchair due to an injury before he was executed at just 13 years old. This photo shows the stark contrast of life after Tsar Nicholas II was abdicated. 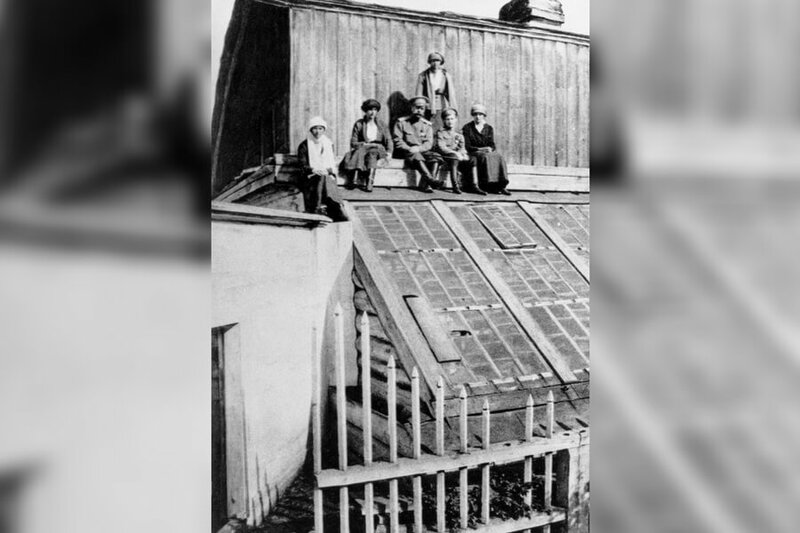 Here, the family is photographed on the house roof in Tobolsk. Tobolsk is the location the family was kept until the transfer of Yekaterinburg in 1918. Although Nicholas II was not exactly admired by the public, it is hard to believe the Russian public wasn’t completely outraged by the horrendous acts of violence towards the Romanov family. 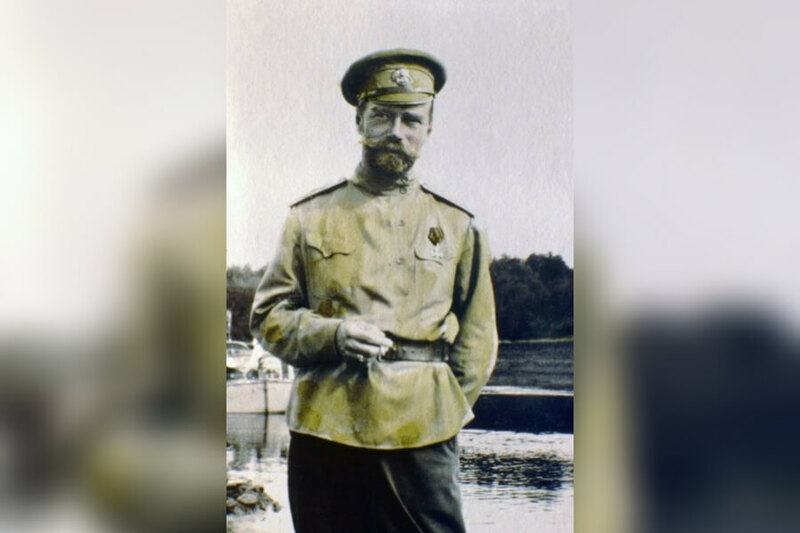 In fact, according to Russian historians, the authorities still received many letters from the public asking to kill Nicholas II even after he had already been executed. 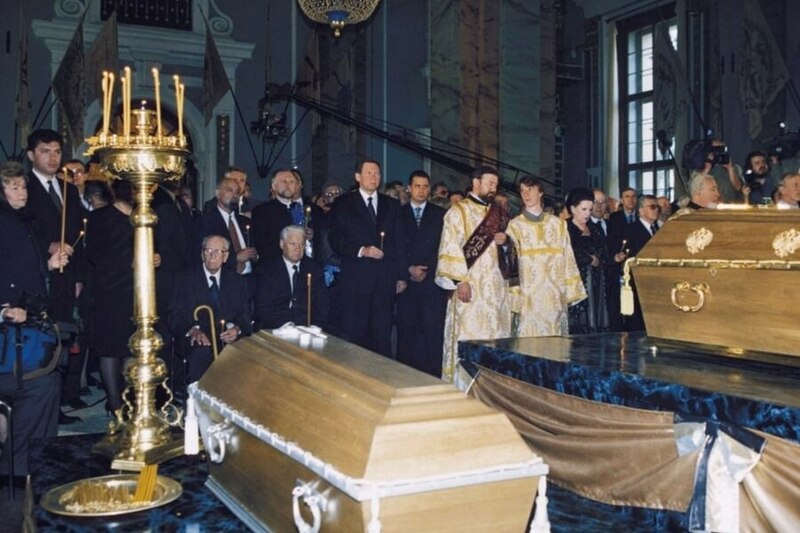 This photo shows the ceremony of deaths of the Romanovs, which took place in 1998 and was meant to showcase the country’s reconciliation with its brutal and corrupt past. The ceremony was attended by Russian President Boris Yeltsin, as well as 50 Romanov relatives. Millions tuned in to watch the ceremony, which was televised, as soldiers carried the caskets of Nicholas, Alexandra, Olga, Tatiana, and Anastasia down a red carpet past various Romanov descendants and dignitaries. Following the ceremony, the remains were reburied in the family crypt. 2017 marked the 100 year anniversary of Russia’s Bolshevik Revolution, which marked the beginning of the end for the Romanov family. 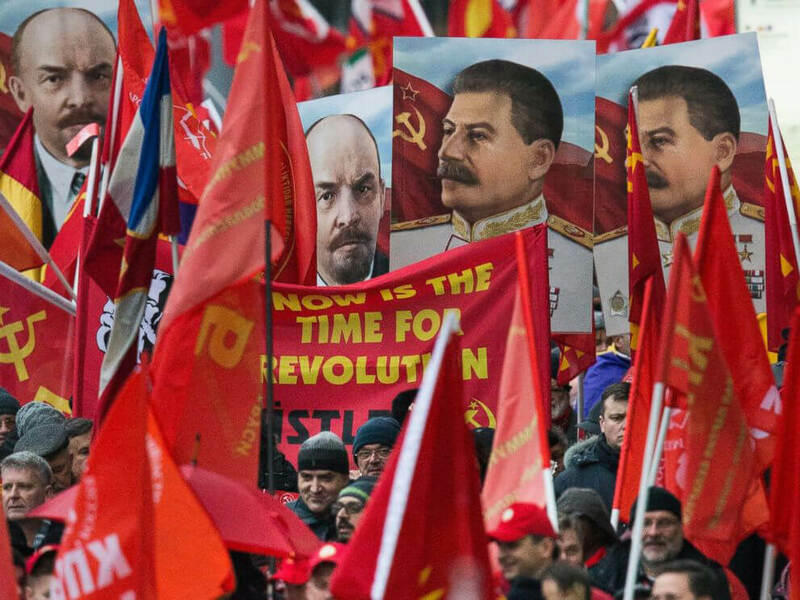 To commemorate the anniversary, members of the Communist party held protests throughout Moscow. Many carried photos of Vladimir Lenin. The Kremlin, not wishing to support a revolution of any kind by the people, remained silent. In November 2017, Mad Men creator Matthew Weiner announced to The Hollywood Reporter that he was working on a new mini television series titled The Romanoffs. The Amazon-produced “anthology,” will depict people who think they’re related to the Romanov Dynasty. Said Weiner, “Every single episode—and there will be eight—has a different cast, a different story and a different location. The thing that holds them together is that all of the stories involve people who believe themselves to be descendants of the Romanov [family].” As noted by The Hollywood Reporter, Weiner’s spelling of the upcoming show is how ‘Romanov’ was spelled until just recently.